Like anything, Valentine’s Day is what we make it. We can see it as a “holiday of obligation”, when we have to appease our significant other with some material offering, lest we really be left out in the cold. Feeling the pressure of commercialism is enough to ruin the spirit of any occasion. Yet the symbols of Valentine’s Day, red hearts and roses, chocolates and cupids, can offer a little color to the otherwise basic black and white winter scenario. It can also be a time of creative self-expression when we think of ways to make others happy, which is a guaranteed way to ensure our own happiness in return. Though Valentine’s Day has traditionally been a special time for lovers, it can also be an opportunity to celebrate universal love. Why limit it? “What the world needs now is love sweet love, no not just for some, but for everyone.” However you choose to express your love to others on February 14th, now is the time to start preparing, so you can enjoy the creative process. Here are some fun ideas to inspire you to put your heart into this Valentine’s Day. 1. Give lots of Valentines – Buy or make your own cards out of construction paper using lacy paper doily hearts and stickers. Let your inner child come out to remind you of those cut and paste skills you learned in kindergarten. If you don’t have the time, you can buy my Valentine cards by the bag. Click here. 2. Write a poem – Instead of watching TV some night, enjoy some quiet time to compose your thoughts on paper. Let your feelings for someone bring out the muse in you, or become a scribe by writing the words of your favorite poets. 3. Plan a celebration – Prepare a favorite meal at home or at a restaurant…(tomatoes, red wine, and dark chocolate are aphrodisiacs). Decorate with flowers, candles, and incense to create a beautiful atmosphere. Compile a collection of your favorite love songs for an evening of inspirational music and dancing. 4. Call someone you know – have a heart to heart talk. 5. Send flowers – brighten up someone’s winter day. 6. 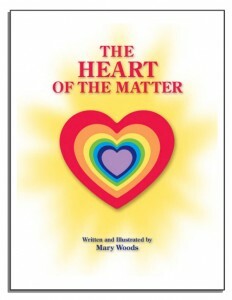 Give a Gift of Heart – May I suggest my book, “The Heart of the Matter”, now available in ebook form. No postage or waiting to get it in the mail, just download it now and enjoy the full color collages and images. Click here to purchase the Kindle copy. You can also buy the ebook version here that can be read in any ebook reader. Look for local dance celebrations in your town. In Williamsport, PA, please join us on Saturday afternoon, February 14, 2015 at Firetree Place 600 Campbell St. 2:00 – 2:30. To keep up with the continuing adventures of The One Eye Love, visit our website www.heartofthematter.us and facebook page Remember Valentine gifts from The Heart of the Matter book, ebook, cards, mugs, and art. Have a Happy Valentine’s Day. 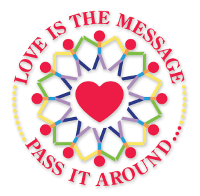 Love is the message…pass it around! 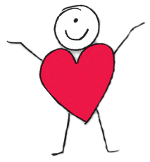 Every year around Valentine’s Day, I think of promoting The Heart of the Matter book and art. Although it was first published seven years ago, it’s timeless message about becoming wholehearted is always a choice we make here and now. This year, however, the message in my book has taken on a new dimension, as the character The One Eye Love, has come to life with the identity of the Holy Spirit, the Divine Feminine within each of us. With her role as the new super heroine here to save the day, she demonstrates that we have to be the change we want to see in the world. We have to be wholehearted and allow the miracles of love to come through us. The realization of the Hopi prophecy, “We are the ones we’ve been waiting for” is the call to stop waiting to be saved in some future event, but to claim it now by living in our hearts and let Love lead the way. The One Eye love had a message to share, so I got to be the instrument of communication via the video David made. It was fun to share it with our friends, family, and social network as part of the collective consciousness. It feels like a celebration of Love and ideas are strengthened by sharing. Will she have more to say? Well, I will have to listen to and follow her inspiration! Here’s to the Heart Activation within all of us. Wholehearted thanks to you for listening and sharing the love! Feel hugged!